This one looked too good to pass up. Quick and interesting read of recent events of interest. Written by a politician from his point of view, with an eye toward the future as he shares his past experiences, through his viewpoint. My note: What he leaves out is almost as interesting as what he includes. 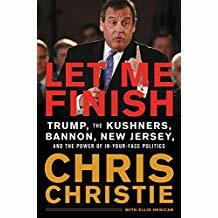 From the outspoken former governor, an "explosive"(Guardian) account of Chris Christie's life in politics including his eye-opening insights into Donald Trump -- "you will like the stories he tells" (Brian Kilmeade).